This is another good episode. Lots of characterization. Christmas, the pressure of the holidays, driving people together and apart. 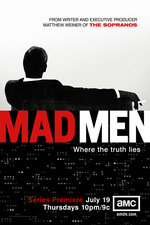 Mad Men, more than any show I can think of, really focuses on holidays (especially Thanksgiving and Christmas). IIRC, someone once had an explanation for this from the commentary, but I wonder if besides the natural drama it creates, it's partially that the build up to Christmas is so important to the Ad business (Pete says they do a significant portion of their business then). Hopefully, Paul Kinsey is in California and has finally come to the realization that his abilities are not in the creative arena. Evidently, he has a talent for salesmanship. Lakshmi: "...he's our best recruiter. I mean, he can really close." Maybe he has dropped the artistic pretensions and become the king of VW Bug sales, or whatever. "Surprise! There's an airplane here to see you!" Am I the only one who hits fast-forward everytime Lakshmi is on screen?